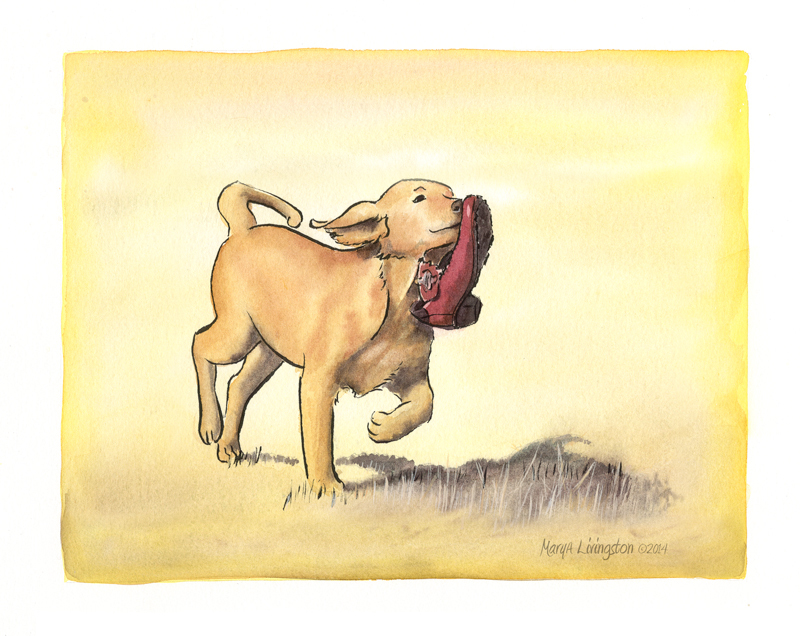 This entry was posted in Art, Illustrations, Ink and Watercolor, Pets, Watercolor and tagged chew shoe, golden retriever, Mary A Livingston, puppy by MaryALivingston. Bookmark the permalink. Thanks and Happy New Year to you, too! wordpress needs a smiley-face button! this makes me smile! ha! yes, a good cobbler certainly helps! i’d worn a new pair of shoes once and the little puppy on ‘the farm’ basically ruined one of the two shoes. after that i called the pup ‘SHOE EATER!’ and it would always cower in shame! Good one Mary. I guess he loves shoes too! Funny thing is, I’m not a shoe gal, so when I have a pair I really like, it’s a treasure. I think Kinta thought it was Happy Shoe Year! Looking proud and pleased with himself ! Super picture Mary . I can totally relate to this one. Very cute and great picture. Happy New Year! Happy New Year! or in the words of Kinta – Happy Shoe Year! Great painting never saw such a proud dog running away with a shoe.. They know their goods… but they do it with good heart so what left for us to do? Marym Tim said he will look after you. He’s tried picking up Tim’s boots a few times. Not big enough yet. Boy, that’ll be a picture to paint! I’ll look forward… is he a seceret giant? or it is the steel toe boot? They are great and anything for a game.. Have a great weekend.